Mosques across Iraq have been targeted in a number of attacks, in which at least 14 people have been killed. Eight people died in attacks on Sunni worshippers in Baghdad and Baquba following Friday prayers. Another six people were killed in a car bombing at a Shia mosque in the northern town of Sinjar, near Mosul. Earlier, at least seven people were killed in an American-led operation against Shia militiamen in the Sadr City area of Baghdad. Police in Baghdad said the explosions at two separate mosques in the capital were caused by a car bomb and a mortar fired at the front of a mosque. In Baquba, north-east of Baghdad, a roadside bomb exploded as worshippers emerged from the Sunni mosque. The Iraqi government recently imposed a driving ban in the capital on Fridays that was intended to stop such attacks. It also deployed tens of thousands of troops on the capital's street. In northern Iraq, in Sinjar, the attack injured nearly 50 people along with the killings. Attacks on mosques and clerics have been a feature of the sectarian violence that has surged since the attack on a Shia shrine at Samarra in February. Early on Friday, Mehdi Army fighters, loyal to radical Shia cleric Moqtada Sadr, battled troops in Baghdad's Sadr City district. Iraqi officials said about 30 people were injured. The US military said troops were carrying out a raid aimed at arresting an "insurgent leader" they blame for a series of attacks. But a senior official in Moqtada Sadr's office said the intended target of the operation was Abu Dera, a senior figure in the Mehdi Army, who is still at liberty. Reports suggest the raid may have been linked to the abduction of a Sunni woman MP seized in Baghdad on Sunday. Sadr City is a huge slum in the east of the capital dominated by Shia Iraqis and home to the militants, in particular those who support Moqtada Sadr. The densely-populated district is home to some two million people. 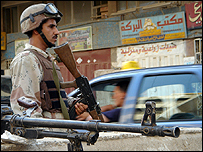 The Mehdi Army has regularly fought US-led coalition forces since the fall of Saddam Hussein's regime in 2003. The group has generally held back from confrontation since two uprisings against coalition troops in 2004, first in Sadr City and then in the Shia holy city of Najaf.